The nuclear power plants at Fukushima were unaffected by a magnitude 6.3 aftershock which shook the area on 12 April. The earthquake struck at about 2.07 pm local time on 12 April, but Tepco has reported that it caused no abnormalities in the reactors at Fukushima Daiichi. There was no shutdown of offsite power, and no interruptions were experienced in operations to inject water into reactors 1-3 and nitrogen into the containment vessel of unit 1. Outdoor workers were advised to evacuate to a key earthquake-proof building, although the evacuation advice was cancelled after less than an hour. The quake caused no casualties at the plant. Tepco's other nuclear power plants in the area, Fukushima Daini and Kashiwazaki Kariwa, also suffered no impacts from the quake. 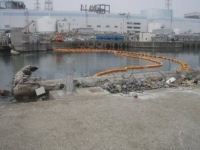 So-called "water curtains" have been installed in a breakwater to prevent the leakage of contaminated water from Fukushima Daiichi unit 2 into the sea. Similar measures are to be taken at units 3 and 4.